Home > Product Management Resources > What is Product Management? > Documents and Templates > What is a Product Launch Plan? Launching your product is just as important as developing a great product. If you don’t do the product launch effectively, customers won’t be aware of your solution, potentially have a bad impression of your product, and you may not hit your revenue and profitability goals. As such, planning early is critical. Start your product launch plan 4-6 months before launch so that when the product is ready for sale you will be ready to effectively execute a launch that meets your goals. 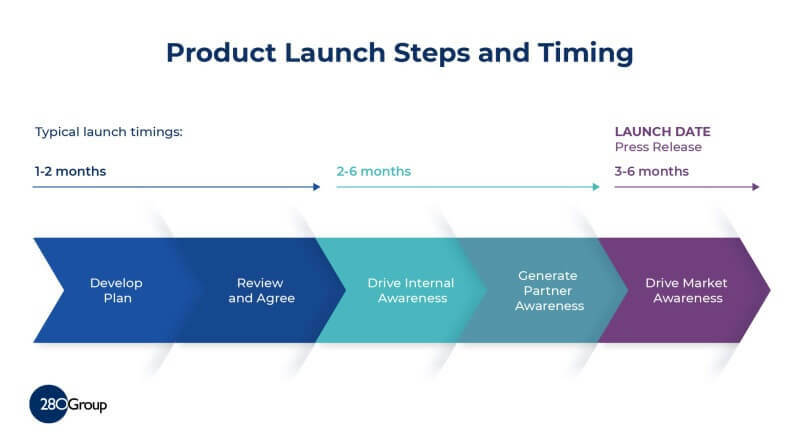 Product launch plans help you sequence the events that lead up to and even past a product launch date. Your goal is to make sure that everyone inside the company, your partners and target customers know about your new product. What size product launch are you working on? Not all products launch and even those that do don’t all have the same type of product launches. Products that are continually updated such as web-based software or smartphone apps use marketing techniques to remind customers that their product is available. Soft Launch: When your product sneaks into the market without much fanfare. Often products sold from one business to another launch this way. You don’t get a lot of attention, but maybe you product isn’t quite ready for prime time so it makes more sense for a few customers at a time to have a look. Minimal Launch: for smaller products or small incremental product changes, the minimal launch gets the word out without a huge amount of marketing spend. Full-scale Launch: To let the whole world (OK, your target markets) know about your product, aim for a full-scale launch. You’ll spend a lot of time and energy making this happen. It also has the best chance for success. Decide which type of product launch is best for your product before you start your product launch plan. Your launch will tell your company and stakeholders what you are planning and how it impacts them. The process of creating it will help you think about the different aspects of the launch so that you are well-prepared to execute on the plan. As with all things in life, spending some time upfront planning your launch will likely pay off with great success. If you have an idea of what your goals are and have a well-thought through plan, you’re at least headed in the right direction. Your Market Requirements (MRD), Go-To-Market Strategy and Product Requirements (PRD) documents are good sources for the topics needed at the beginning of each product launch plan. A product launch plan template includes a brief back story to the launch. Most of the launch plan is a long list of launch activities and reasons for each of them. The better you can tell the overall launch story and how all the pieces fit together, the better you can defend your launch plan and the budget you’ll need to execute the launch properly. Summarize the goals of your campaign: company messages, product audience, goals for the launch, and how you’ll measure the launch success. Identify key features of the product you’re launching here, including features, functions, and system requirements. Complete this after everything else is written. Include a brief description of the product (2-3 paragraphs) that describes what the product is, the main features and benefits it provides and how it solves customer problems. Who are the product personas? What are your target market segments? What business segments are you targeting? What are your key messages for the product? For your company? This information comes from the messaging platform based on your product positioning. Include the specific criteria that indicate that the launch has been a success. Include concrete and measurable goals such as revenue targets, number of partners carrying the product, and channel availability. List all critical dates and milestones including product availability, finalizing product name, budget, positioning, and press activities. Who is allocated to support customers through the beta program? List an overall timeline of all activities in the launch plan that need to happen. What is the budget for your launch plan? Provide a pie chart of how you’re allocating the launch budget and give the details in a table. A product launch is exciting. Make sure to add elements of market excitement in your plan for the best results. Good luck!